Todd Greene’s business is built on baldness. But he hates that word, choosing to call himself a head shaver. That distinction is critical in defining his sense of self and his business. It all started when Greene began losing his hair and realized he didn't want to get a hair transplant or use Rogaine to hide it. “The idea of balding is passive. It is being a victim of circumstances. Something is happening to you. It is like attrition,” he says. Todd Greene (L) with basketball player Al Harrington. It was also the beginning of his life as an entrepreneur. When Greene began shaving his head, there wasn’t a razor on the market that was designed specifically with the quirks of shaving a head in mind. If you think about what’s involved in shaving your head, not only are you working with a round surface, but you're also flying blind when it comes to the back. Greene designed a razor with these challenges in mind. The HeadBlade razor has a curved shape and a finger hold that allows a man’s palm to stay in contact with his head at all times while he is shaving, among other unique features. Prior to designing the HeadBlade razor, Greene, 46, was working in art animation for software companies, including Starwave, the Seattle-based shop founded by Microsoft co-founder Paul Allen. Greene had a hunch that his desire to shave his head was just on the cutting edge of a change in public perception of head shaving. 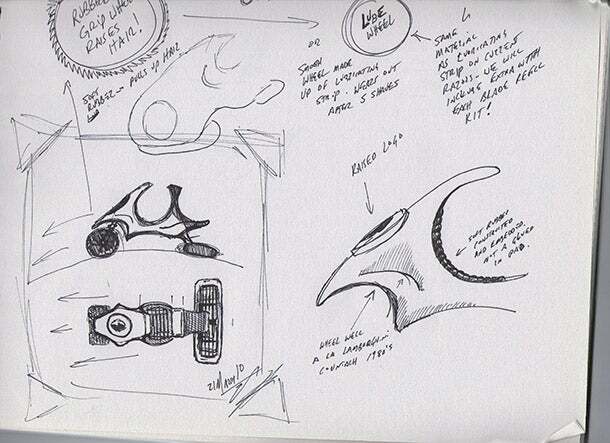 Sketches of the new generation ATX HeadBlade razor being developed. From March of 2010. Despite Greene’s hunch, he struggled to get others excited about his idea. He was prototyping the razor in the late '90s, when investors were falling over themselves to invest in Internet technologies. “It really was a very, very entrepreneurial startup because I was creating or inventing a product that never existed for a market that never existed,” says Greene. “I was starting everything from scratch and there was no roadmap.” Today, Culver City, Calif.-based HeadBlade has annual revenues of between $5 million and $10 million. The razor itself retails for between $13 and $15. When Greene's razor first came to market in 1999, its design -- which looks almost car-like -- was regarded as being especially innovative. In 2000, Time Magazine named the HeadBlade one of the year’s 10 best inventions. In 2004, the HeadBlade razor was included in the Museum of Modern Art’s (MoMA) Humble Masterpieces exhibit, one of 120 items selected for being often overlooked items of everyday utility that are also “indispensible masterpieces of design, deserving our admiration.” The HeadBlade has since been included in the MoMA’s permanent collection. 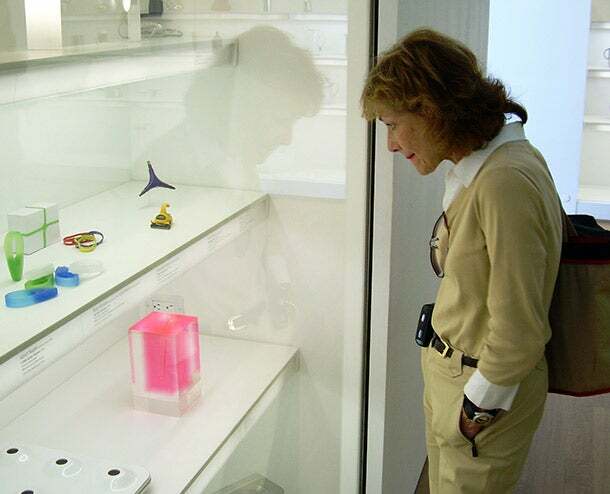 Elaine Miller, Greene's mom, looking at the razor displayed at the MoMA. Being in the MoMA gave Greene street cred. In the early years, he sank $150,000 into the company and was walking shipments to the post office himself every day. But having his razor in the Museum of Modern Art in New York City gave Greene even more faith in what he was doing. “We are talking about a razor that retails for $15, yet for me it was the passion of years,” says Greene. Greene wants to keep his focus narrow and his base happy. For instance, while the shape of the HeadBlade razor is actually effective for women to use shaving their legs, Greene hasn’t jumped into the market for women head first. That’s because he doesn’t do things halfway. To roll out a brand for women with the same dedication and follow-through that Greene used to roll out the brand for men would take significant time and resources. And he's devoted to his niche. HeadBlade launched a new razor model in 2013, the ATX or All Terrain Razor, which is more user friendly than the original design because the motion used in shaving with the ATX more closely resembles that of a traditional razor. But while the new model of the HeadBlade is where the focus of the company is going in the future, Greene says he will keep making the first iteration of the product for the die hard devotees. He wants to keep his fan base happy, as they keep him in business against the likes of Schick, which is owned by Energizer, and Gillette, which is owned by Procter and Gamble. “People wear HeadBlade shirts and love HeadBlade hats and the logo. You don’t see people wearing ‘Shick’ shirts. It’s not a lifestyle brand, it’s a manufacturer,” says Greene.